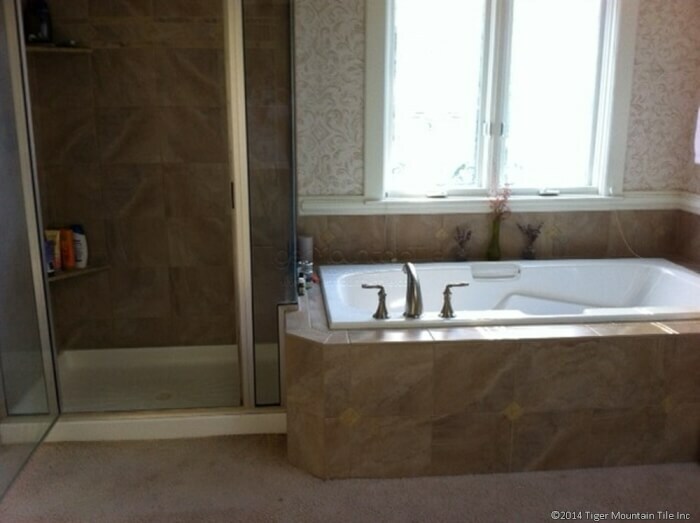 A bathroom renovation that blended the homeowners wants with resale value in mind. 3. They had a small nagging mold issue that they just couldn’t figure out and wanted to finally get to the bottom of. These things set the goals of the remodel. They challenge from here was figuring out what to replace and what to keep. They wanted a bathroom that they could enjoy but also set a budget because they knew they were not going to stay there long term. 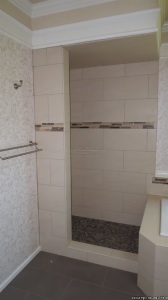 The items on the chopping block were the carpet (always unpopular), the existing tile on the shower and tub, the white shower pan, and the old framed shower doors. Although they would liked to have changed their natural stone tile counter top on their vanity to a one-piece slab they just didn’t feel like they would get the bang for the buck in regards to the resale value with that upgrade. Also the expense of removing the wallpaper and having to re-plaster the walls was an easy decision: the wall paper stayed. Since the shower and tub faucets were replaced in the last remodel and still looked good and functioned well they didn’t get replaced either. However, they could look forward to new updated shower and tub tile with a tile shower pan, a new tile floor with electric in floor heating, and stain-proof grout throughout. The clients had been noticing that the carpet by the shower would get wet and their seemed to be mildew when pulling the corner of the carpet back. This isn’t a crazy place to get dampness because the shower door will drip onto the carpet when it’s opened. But it still seemed a little out of the ordinary. When we tore out the shower walls we found a little surprise. A slow drip in one of the pipes. Over the course of ten years this slow drip was causing the inside of the wall to mold along and was eventually getting to the outside corner of the shower under the carpet. 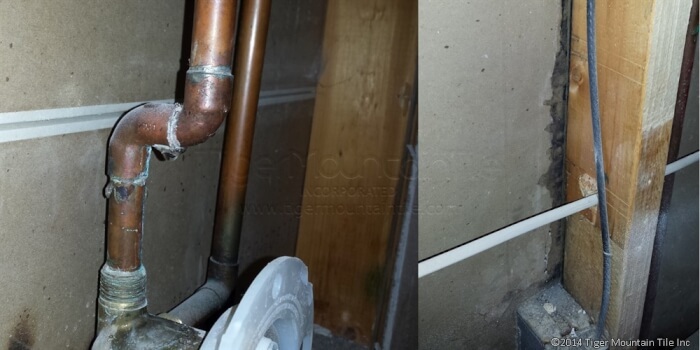 This pipe was cut out and replaced by a licensed plumber and the mysterious water problem was finally solved! For this project we went with a Suntouch wire system and used RPM pads for the floor. Without the RPM pad system it’s difficult to keep the floor heights even between the tile bathroom floor and the carpeted bedroom floor. Using this system also gives me the freedom to run the wire wherever I want the floor to heat instead of having to use a preformed pad or roll that is made for more perfect rectangular shapes. Suntouch has a great touchscreen thermostat that we used although it was tricky installing it in the already wallpapered walls with no room for error. 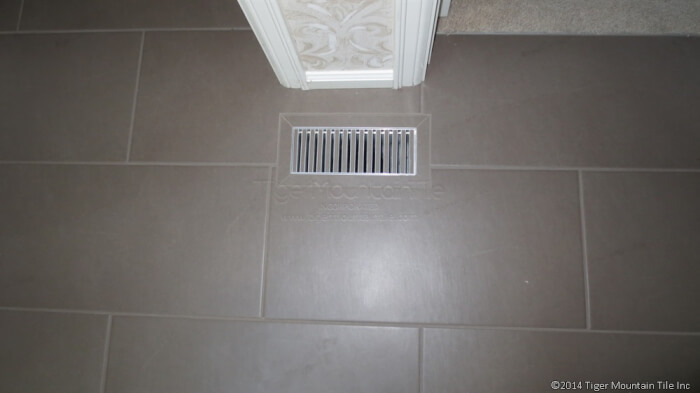 Large format olive colored 12×24 tiles were installed on the floor in an offset pattern and a tile-in vent was used for the heat register. 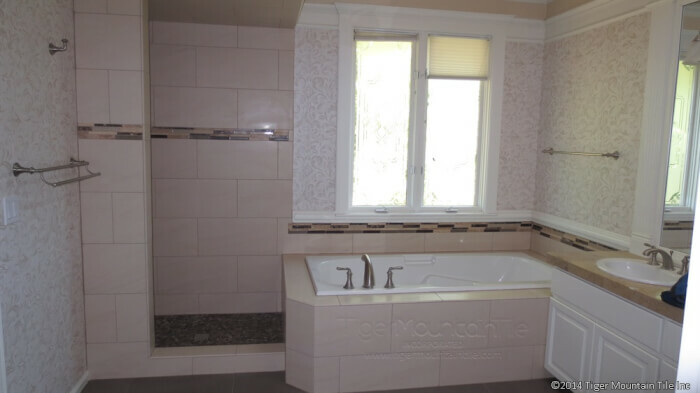 When selecting the tile the homeowners wanted to update the bathroom but also wanted to make tile selections that tied in with the room and fit the look of rest of the house. They decided to go with a neutral 12×24 wall tile, a marble hex shower floor, and an accent that tied everything together. The tile was a through-body tile which means that the edges of porcelain tile itself can be bullnosed. We have a profile machine just for this purpose. This saves having to order separate bullnose trim pieces and gives it a more custom look. We added a skinny wall so that the heavy frameless shower doors can bolt into it. We also used this wall to install two recessed tile shampoo niches which allowed the clients to store their shampoo and soap in them rather that the corner shelves they previously had. An added benefit was that the shampoo bottles would now be out of site and provide an uncluttered look. 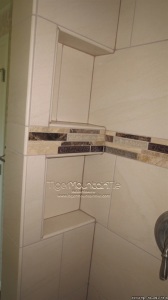 All the grout selected was stain-proof Fusion grout from Custom Building Products. This grout technology is amongst the best available and allows for the easiest maintenance. 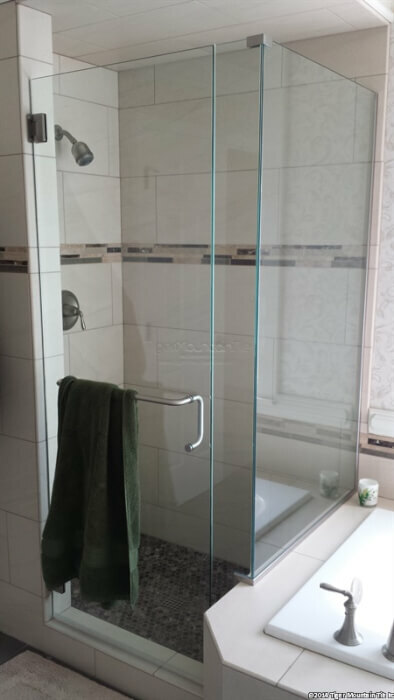 In all the bathroom accomplishes what the homeowners wanted: An updated bathroom that they can enjoy and it will become a selling point when the put the house up for resale. 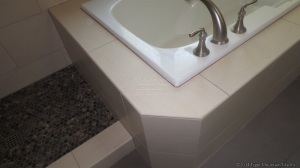 This thru-body porcelain tile allows for custom bullnose profiled edges. No more thin bullnose pieces.